The latest plans are in for the building slated to go up in conjunction with a renovated Elks building by the McMenamin's folks. "Leaked" here, The News Tribune is also reporting the Landmarks Preservation Commission folks are happy with the latest round of designs. Have a look at the mock-ups below and sound off with you thoughts. by Jesse on 7/14/2011 @ 7:59am This will bring a lot of people to that hood. I like. by Rick Jones on 7/14/2011 @ 8:48am Spoke with Grace Pleasants Sunday at 6th Av Art on the Ave. Funding for the North building continues to be a problem. Not overcome-able, but an issue that needs more time to develop. that means they need an extension from the City. Let's make sure the City gives them all the time they need. We are so close on this one and it means so much. by KevinFreitas on 7/14/2011 @ 9:05am As I just posted on Twitter, I'd definitely like to see some brick in there and just warmer tones in general. Kinda' a cold character overall. by fredo on 7/14/2011 @ 9:25am Who is paying for this mixed use building? Is it a developer, the city, or some kind of public/private partnership? Instead of looking at a mock up for the building, I'd rather look at a mock up of the financing arrangements. having said that, it would be nice if the landscaping would include some ratty old monkey puzzle trees to tie in with the McMenamins complex. by Rick Jones on 7/14/2011 @ 11:01am @fredo: The funding for the North Building is a combination of city money (parking), private investors (developer), and fed money. The issue is qualifying for the fed funds. Given they're working with the federal government it gets complicated and onerous. Monkey Puzzle Trees? Bleh! Not native, not attractive, not worthy. by The Jinxmedic on 7/14/2011 @ 11:18am I second Fredo on including the Monkey Puzzle trees. White Europeans aren't native, either- but they're not leaving anytime soon. Deal. by fredo on 7/14/2011 @ 12:08pm I'm tired of the public private partnerships. We've really created a Frankenstein as it were. No longer is any developer willing to do anything that doesn't have a taxpayer component. The same people who post constantly about the horrible wall street bailouts will applaud the use of tax funds to help out these projects. Makes no sense. These are never financed (it seems to me) with revenue bonds, but rather general obligation bonds which the taxpayers are on the hook for even if the project fails. This is the definition of socializing the costs and privatizing the revenues. I'm sure the developers are nice people but our society doesn't make development funds available to small and intermediate businesses with nearly as much enthusiasm. Not mentioned is that the cones can get extremely large and heavy and that it is not advised to plant where people gather as the falling heavy cones are known to have caused injury or sometimes even possibly knock out people unconscious. I also refer to this particular variety of tree as the assault tree. Probably good to plant around the county-city building. More about the possibly dangerous cones can be found here. Some cones can possibly get extremely large and weigh between 15 to 25 pounds on older larger trees. by L.S.Erhardt on 7/14/2011 @ 2:36pm I for one like the new design. I think it looks a lot sleeker and modern than most buildings in town do. It'd be a welcome addition to my neighborhood. I just wish it was 15 stories taller. by cisserosmiley on 7/14/2011 @ 4:10pm i love it! i was easy to complain about this building not fitting in that neighborhood, but with the extra stories i totally love it! I was actually thinking the exact same thing! The design with all that glass looks better suited for a much taller building. In fact, yours looks like it should be the original design and their renderings look like the photoshopped ones. by Jesse on 7/14/2011 @ 4:48pm I agree with the rest of you. Thorax has a version of this project that makes the Elks Lodge look like it's a gym or some sort of service building for the taller glass structure -- it actually works quite well visually I think. by fredo on 7/14/2011 @ 5:12pm That building would be a fine pedestal for the 300 foot tall statue of kevin rojecki you were going to build thorax. by NineInchNachos on 7/14/2011 @ 6:25pm approve! by L.S.Erhardt on 7/15/2011 @ 1:29am No, silly Fredo. It's a 300 meter tall statute of Admiral Ackbar. 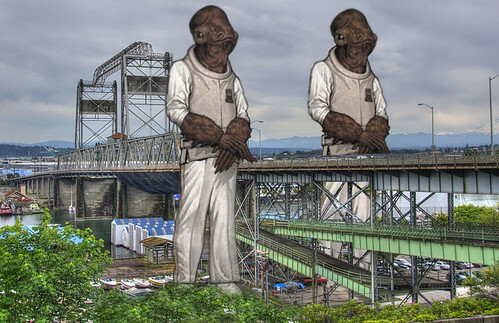 by Jesse on 7/15/2011 @ 7:32am Admiral Ackbar standing on top of the Elks ready to climb the glass tower like Godzilla. by thriceallamerican on 7/15/2011 @ 11:19am It's a trap! by L.S.Erhardt on 7/15/2011 @ 1:28pm I love that picture. Really, I wish I knew how to get that project going.